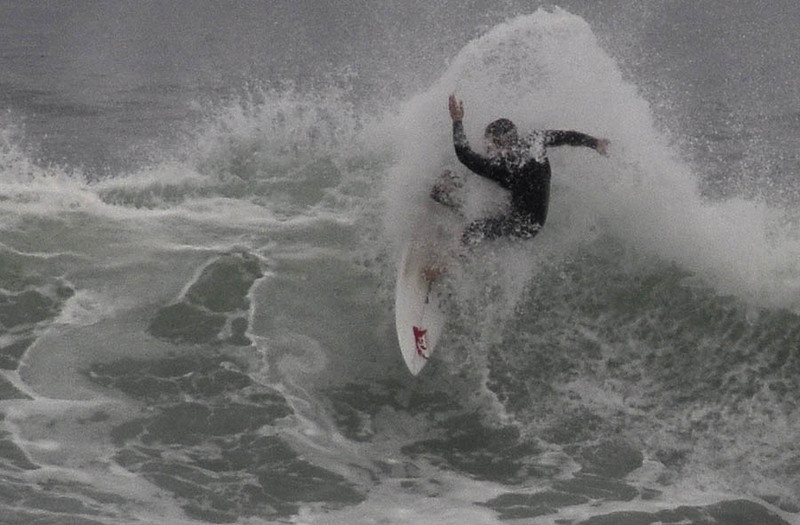 San Diego may not have rain yet this year but we do have waves. Morning surf at Sunset Cliffs! I had time to swing by Sunset Cliffs for about an hour yesterday morning. 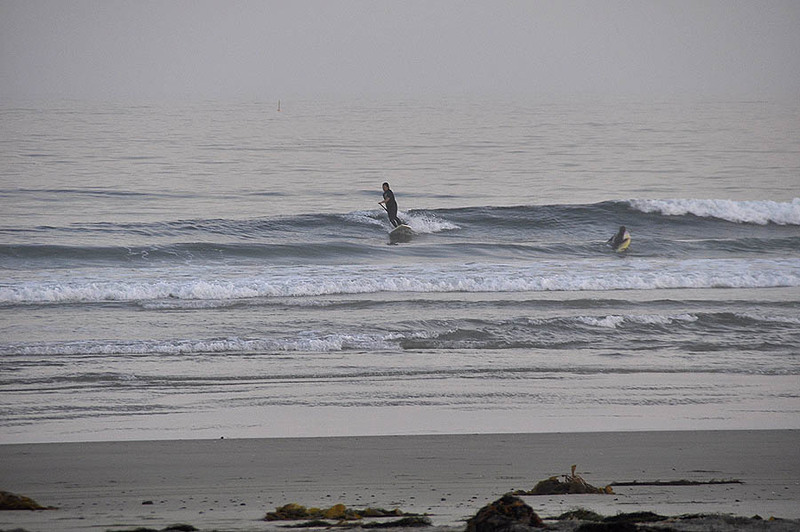 The WNW swell was dwindling and spacing between sets growing, but there were still some ridable waves. I’m planted on the cliff at south garbage. I shot the video in 1080p HD; unfortunately I can’t make WordPress display YouTube HD by default, so when it starts playing you need to click YouTube’s settings button (the gear icon in the bottom right of the video window) to select HD. If any WordPress.com experts out there know how to make the embed shortcode for HD display to actually work, please let me know! Nothing like a little air time to energize the rest of the day. Big Rock (near Windansea) in La Jolla. 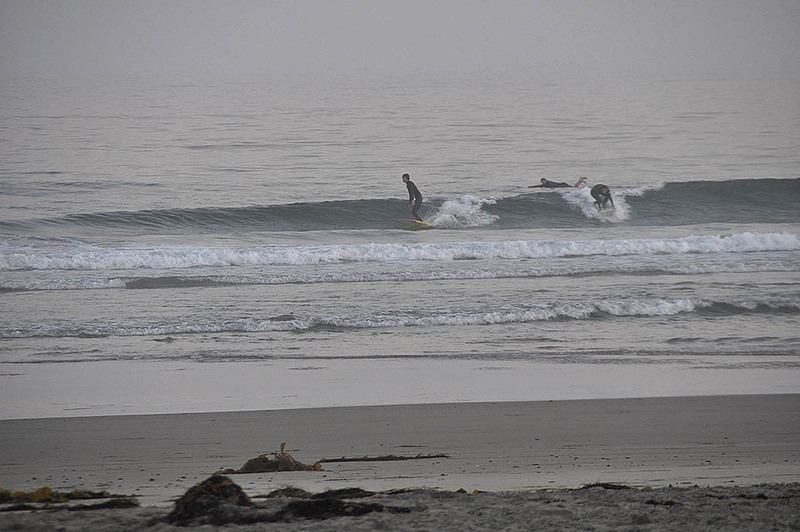 There was some energy in a mixed swell this morning, but it was fading fast. By the time I took the last shot in this video, sets were a good 15 minutes apart. For awhile, though, it was pretty fun. It’s been a good while since I made any surfing videos, so this morning I decided to go see what the dawn patrol was up to at Windansea. 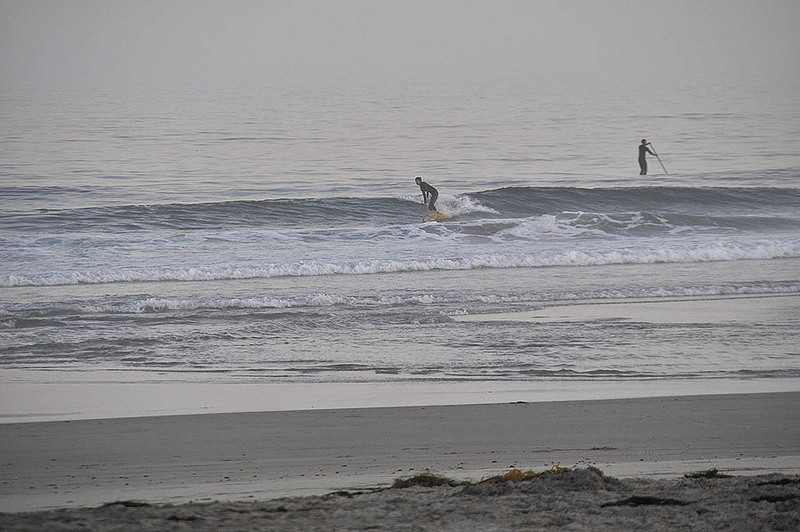 There was only one pair of surfers which was just about right because there were long lulls between sets and there were usually only three waves to a set. The tide was high and surf was breaking just feet away from the abrupt rocky rise at the shoreline. You’ll see a few rides that got pretty close. 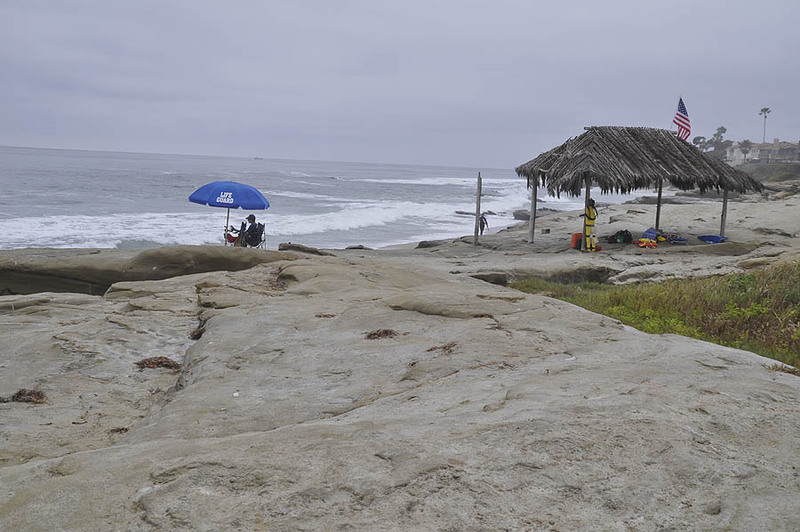 Next I went to nearby La Jolla Shores. 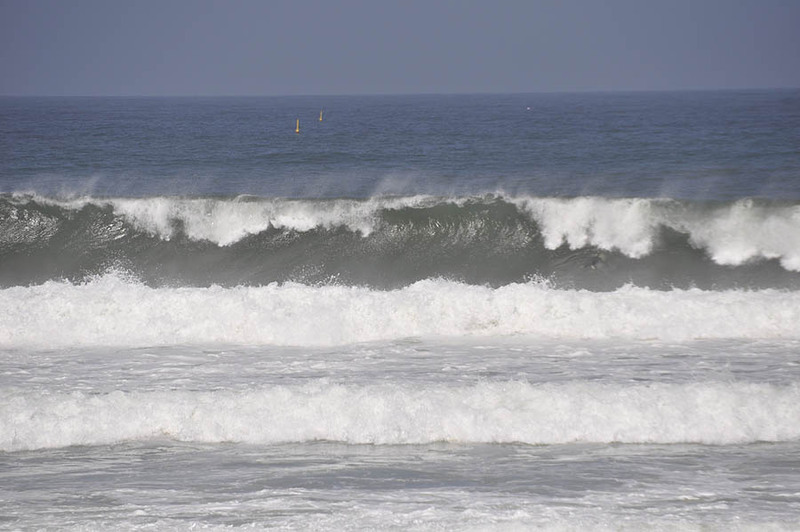 The waves were coming much more frequently than at Windansea, but they were smaller and gentler. The water was quite crowded, but I think everyone was having fun. Okay, here’s the video. If you’re using a relatively modern desktop computer (not a mobile device), go ahead and set the video to 1080p and watch it full screen. With a long weekend beginning and warm sunny days in the forecast, a visit to the beach could be just the thing. Unfortunately there isn’t much of a swell for surfing, so a long board is probably called for. Whatever you do there, it should be quite enjoyable especially by noon after the haze burns off. Here are a few beach area photos that I took during the past ten months, so I’ll show you ten beaches in all. 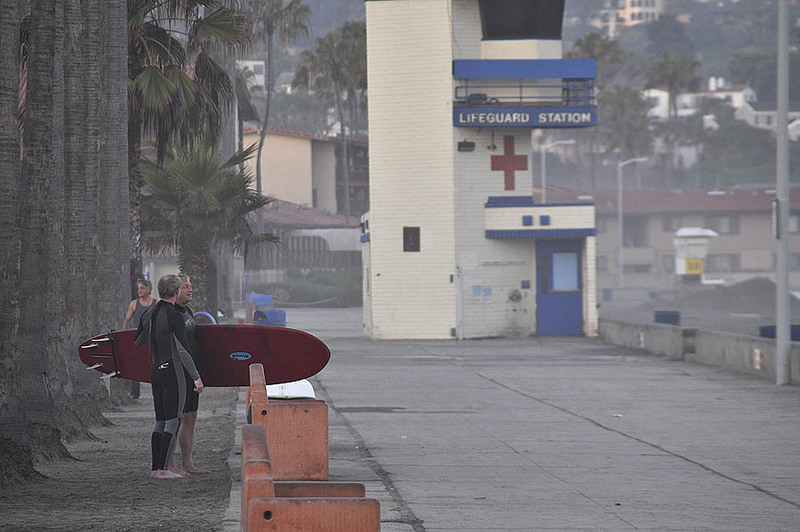 This Friday morning’s surfing spot check brings us to La Jolla. 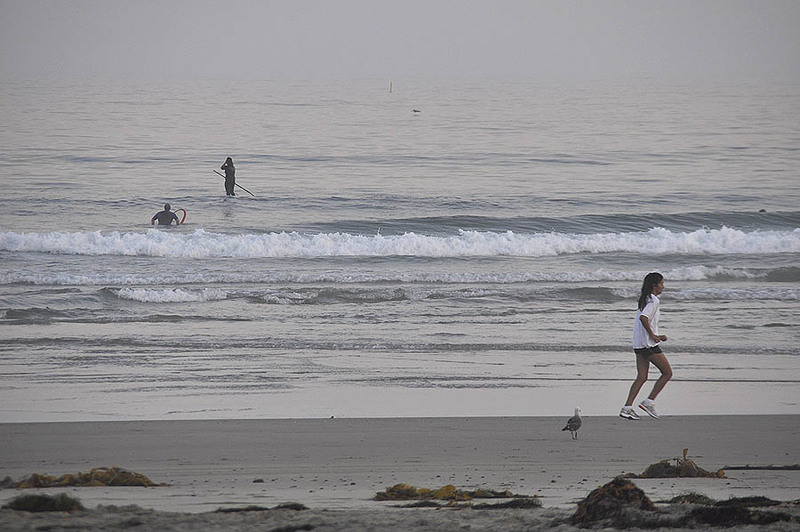 The mixed SW swell’s angle gave Windansea a bit more size and shape than La Jolla Shores, but in both places the surfers seemed to be having a good time. Just before sunrise, the temp was warm, winds were calm, and it was a bit hazy and quite humid. As usual, click pictures for enlargements. The fire must have been for atmosphere because it was warm outside! Mostly shades of grey this morning. Talking waves at the lifeguard tower. 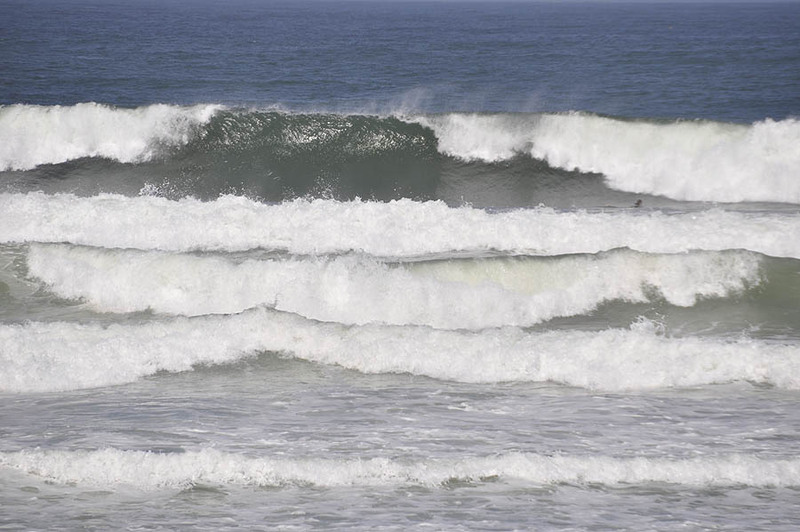 The fireworks were held in La Jolla after all, and on Monday July 5 some southern hemi energy was producing decent swells for Windansea, although there were long breaks between sets so when a group of 3 or 5 waves finally did show up things got a little competitive. The weather was overcast and humid with just a hint of breeze that didn’t disturb the nice glassy conditions. Besides the surfers there were no people on the beach so the lifeguards didn’t have much to do besides rearrange equipment and adjust their sitting positions. Between 8am-10am anyway! There’s a short video below. Red Bull Rivals is a one day surf event pitting San Diego’s North and South County locals against each other. Tapping into an area that consistently churns out heavy-hitters in the surf world, the contest will showcase some of the most talented local up-and-comers. Surfers from each county will be invited to battle it out in a head-to-head competition at Ocean Beach for ultimate bragging rights. Two teams of 10 will be chosen by Ocean Beach Surf and Skate in the South and Quiver Boardworks and Cole Surfboards in the North. 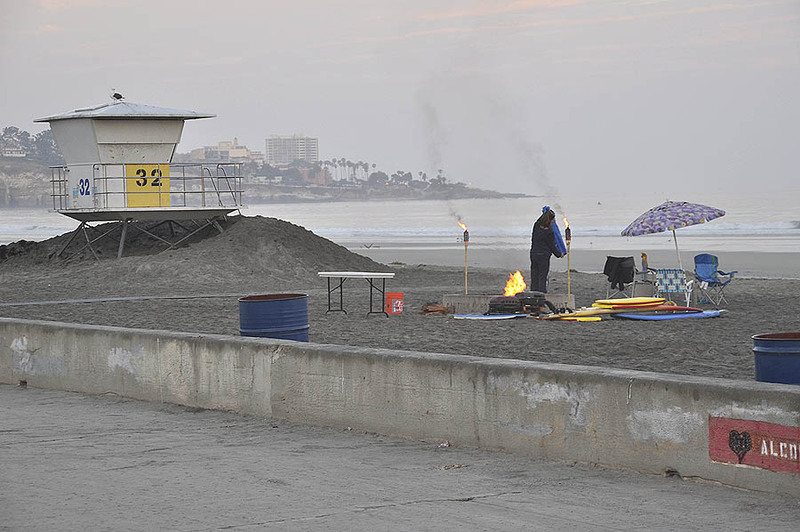 Unique to this contest, the surfers will compete in a tag team format, where one surfer from North County and one from South County will enter the water together and surf their best three waves. They will then run to shore and tag a teammate to go out and do the same; judges will score the best two waves of the three for each surfer and at the end of the day the team with the most points wins. The losing team must give up their surfboards to the winning team, and the winning team will then donate the boards to the Surfrider Foundation. Twenty of San Diego’s best local surfers, trying to win bragging rights for themselves and their county (exact names of surfers TBA). Judges will include: Pro surfer Jamie Sterling and ASP qualified (judging) professionals. 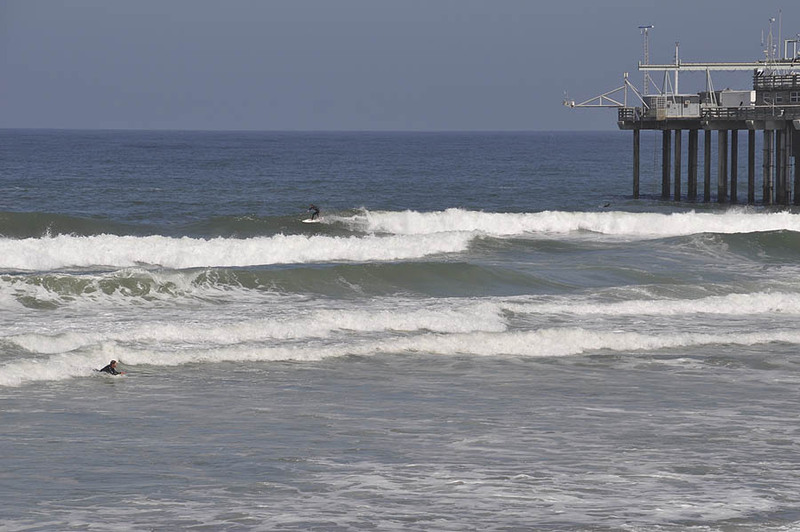 Today’s 9:30am visit to the SIO pier found good size but somewhat junky surf from yesterday’s winds. An onshore breeze was building which didn’t help matters much. 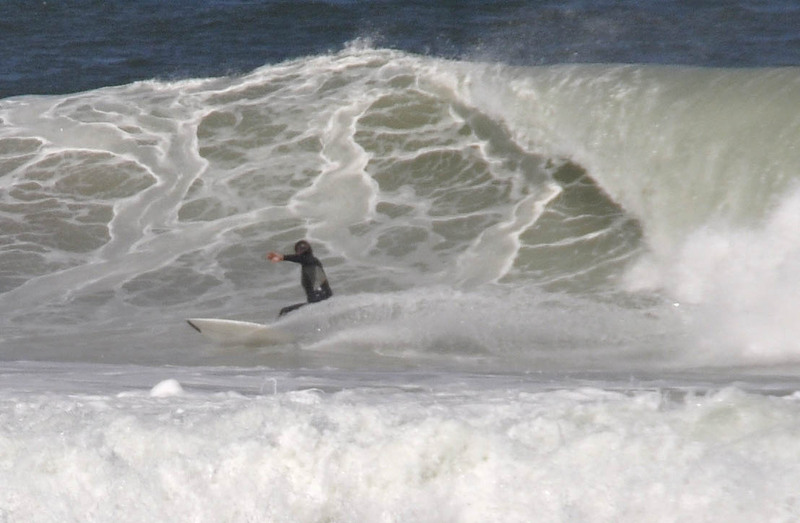 Most sets were closed out, surfers had little to choose from between sets, and rides were very short. Click for enlargements.